The most tell-tale sign of athlete’s foot fungus is an itchy, red rash between the toes. Cracked, blistered, peeling skin between the toes and on the soles of the feet is common. Itchy blisters may form in extreme cases, but not always. Sufferers may notice a slight odor as a bacterial infection develops and breaks down the skin. The skin will be terribly dry on the bottom and sides of the feet. There is a burning feeling on the soles of the feet and between the toes. Infected toenails (onychomycosis) will become very thick and yellow, crumbling around the edges. The most common type of athlete’s foot occurs between the fourth and fifth toes. Usually the skin turns a moist, pale white and progresses to an itching, burning red. The webbing of the toes becomes cracked and scaly. If the skin becomes infected with bacteria, it will release a foul odor. This long-lasting infection often begins with irritation, dryness, burning and itching. The skin becomes thickened and scaly, causing the heel or sole to crack. The worst cases involve toenails that thicken and crumble. This type of athlete’s foot is not terribly common, but it begins with a sudden outbreak of fluid-filled blisters on the instep, toes, heel, or sole. Scaly skin and a bacterial infection are commonly associated with this type as well. Sometimes people confuse their symptoms of athlete’s foot with a condition called “keratolysis,” which is caused by too much weight placed onto the heel of the foot, causing a honeycomb-like pattern of cracking, excessive sweat and odor. Eczema is another common misdiagnosis. This form of inflammation and dermatitis causes redness, swelling, itching and cracking. In other cases, athlete’s foot may look like Erythrasma, a skin disease causing brown scaly patches to grow in the skin folds. Athlete’s foot will not go away on its own. The condition will only worsen until the itching and burning is downright intolerable. Over-the-counter antifungal creams like Lotrimin, Tinactin, Lamisil or Micatin can be purchased from the pharmacy. Ideally, the symptoms will clear up within 2 weeks and be completely gone within 4 weeks. Got athlete’s foot? Use SteriShoe to help prevent a recurrence. However, keep in mind that the possibility of toenail fungus and reinfection is high. Medicinenet.com warns that “Simply treating the soles and ignoring the concurrent fungal infection of toenails may result in recurrences of athlete’s foot.” In addition to keeping your feet clean and dry, you’ll want to disinfect your shoes daily to kill any fungus or bacteria harbored in this moist environment. 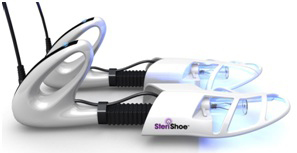 SteriShoe® is a patented device that uses UVC light to kill off up to 99.9 percent of the harmful bacteria that causes conditions like athlete’s foot. It’s been recommended by thousands of doctors to help patients prevent the recurrence of troublesome foot infections. It’s best to see the doctor right away if the red, cracked skin on your feet has been itching and burning for more than 2 weeks, even with treatment. Prescription antifungal creams or oral antifungals may be needed to clear up the rash. Possible complications of athlete’s foot fungus include secondary bacterial infections, soggy tissue breakdown, and allergic response that causes proteins to enter the bloodstream and eruption of blisters on the fingers, toes or hands. It is especially important for diabetic patients to treat any foot fungus symptoms right away. Smelly Shoes: How Dirty ARE They? Home Remedies For Fungus Nails: Does Lysol Work?